Our most popular digital electrotherapy unit. The Twin Stim 2nd Edition is an exact combination of our TENS 7000 and EMS 7500, which gives the user the choice of five Modes of TENS and two Modes of EMS. Features include, dual channels, seven modes, timer, patient compliance meter, new stronger 100 mA output, safety amplitude cover, sturdy metal belt clip and rubber side railings for maximum handling. TENS/EMS Units & Stimulators can be found in our extensive online collection of products from globally recognized and trusted brands, including Current Solutions. 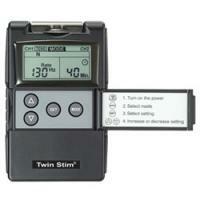 An excellent option to consider is the Twin Stim TENS and EMS Combo 2nd Edition.